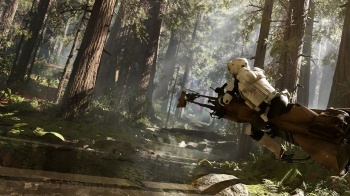 Star Wars: Battlefront on PC will lack any kind of built-in voice chat. The official Star Wars: Battlefront Twitter account has been taking questions from fans this weekend as part of its beta promotion, and we have sadly just learned that the PC version of the game will lack any kind of built-in voice chat. "You can choose your favorite third party software to communicate with friends on PC," replied EA when a fan asked about the feature. While it is true that most serious PC gamers usually default to 3rd party apps like Ventrilo and TeamSpeak for their VOIP needs, the lack of an in-game options means that to talk with strangers in the game, you'll have to resort to text-based communication. EA later confirmed that the console version of Battlefront will utilize the PlayStation 4 and Xbox One built-in party system for in-game chat. While this is kind of disappointing, my time with the Battlefront beta has led me to believe that this won't make too much of a difference. With a lack of squads and features like the commander, it has a very "every man for himself" kind of feel. Still, the lack of a feature is still the lack of a feature, and as Battlefield 4 had its own built-in voice chat, it is a step backwards.